Dragon Skull w/ Wall Mount - 16 in. 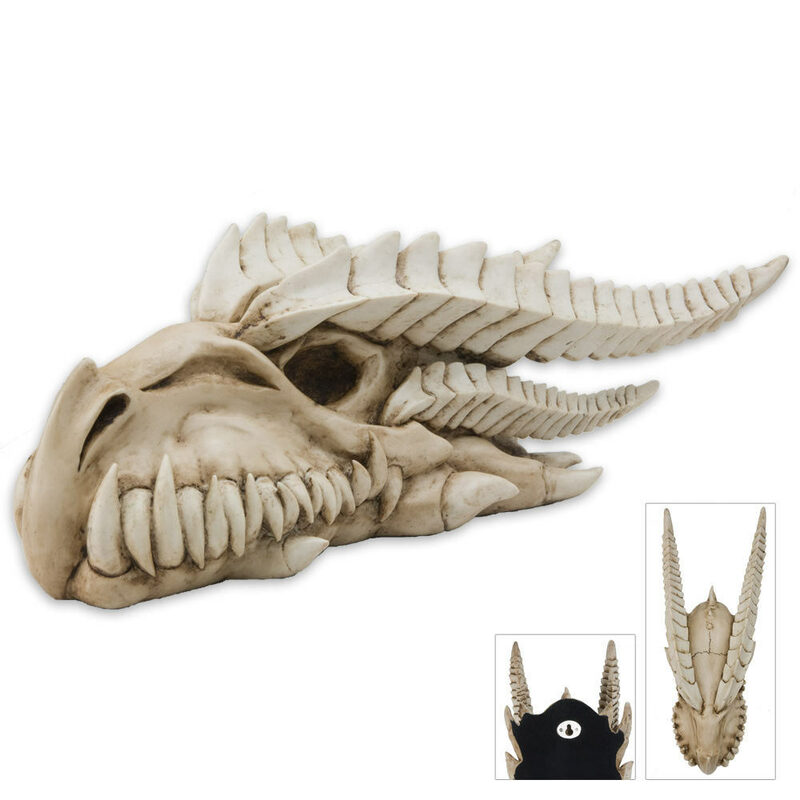 Only a real dragon slayer would have a dragon skull mounted on their wall. This 16" cast resin beast looks and feels like an aged medieval artifact with its hand-painted details. The back is felt-lined to not scratch surfaces and can even be mounted on a wall with included wall-hanging hardware. Very nice detail on the skull, nothing out of place and it is a pretty nice size. The teeth are my favorite part as they pop visually (and physically) from the skull. Would be at home on a shelf moreso than as a hanging decoration since the top-down view really isn't as impressive. Only issue is that the mounting hold on mine is significantly tilted, pretty sure it doesn't matter and it'll end up on a desk or shelf anyway. Very nice for anyone who likes fantasy pieces. Very nicely done, I'm extremely pleased with this! Great detail, really much nicer than what you can tell from the photo. As usual, trueswords offers the best price and best service. I'm always happy when I can find the things that I like here. This dragon skull is the best!!! It is so life like. (If dragons were real) I love skull themed things, swords, knives, shirts, etc..This by far is the best!!! The way the teeth overlap is so lifelike to me. Great product for the price. It always gets attention from guests at my house! Wow this is cool. Great detail and heavier than I expected. Really happy with this purchase!